Running a marathon for the first time can be a daunting prospect. The length of the race can be mind-blowing for some, while others can be put off by the tough training schedule. Experienced runner Simon Walker, a car mechanic from Bolton, has run marathons on three continents and has collected a wealth of knowledge that can help runners to the finishing line. Question: Long training runs can be really boring, so what’s the best way to keep them interesting? Question: Is there a way to make the marathon race distance feel less daunting? Question: A lot of runners talk about ‘hitting the wall’, but what does that mean? Question: So how do you avoid ‘hitting the wall’? Question: How much water does the average runner need to consume during a marathon? Question: What is your top tip for race day? Question: How long a warm-up should a runner allow for before the race starts? Question: What’s the best way to recover after a marathon? Answer: “Try to consume food and fluid straight after the race and, if possible, have a very light massage. It is best to avoid running for a few days to allow the body to recover fully, although it is okay to go for a walk, cycle or swim. 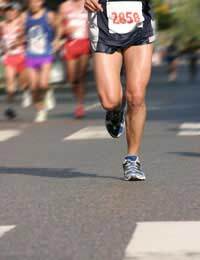 Arrange to have a heavier massage three or four days after the race.